You’ll be amazed what your Tongue has to say. Learn to perform a Tongue Health Diagnosis and how to scrape your tongue correctly. You will love these awesome tips. Have you ever wondered why your visit to your doctor usually starts off by asking you to poke your tongue out? 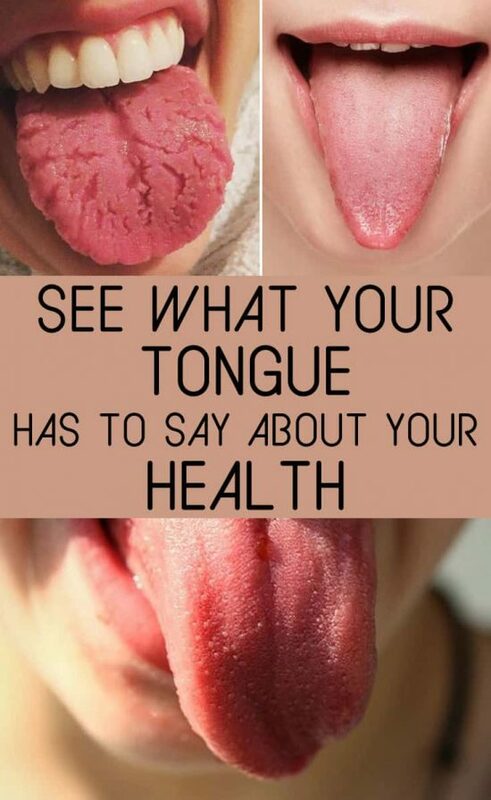 You’ll be amazed at what your tongue reveals about your health. 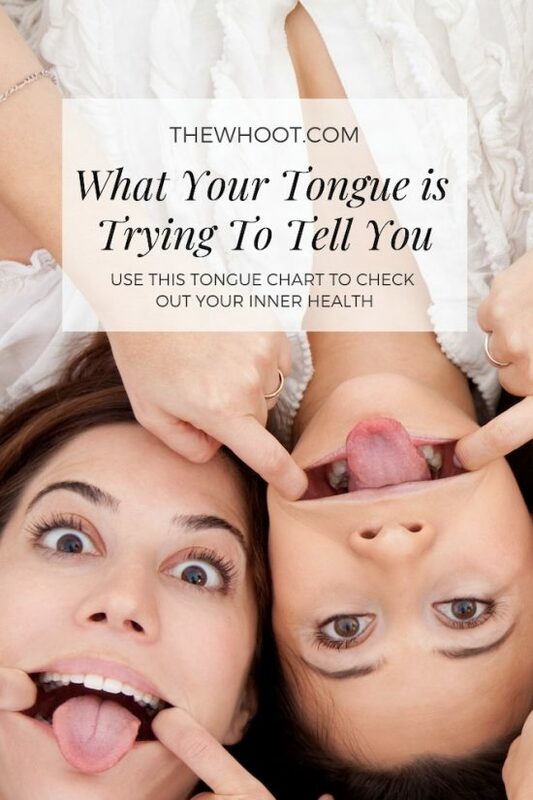 The tongue is an important indicator of health and is linked to many vital organs. The different color, shape, bumps and texture give inside information that can greatly assist you. The back of the tongue reflects your bladder and kidneys, the tip is linked to heart health, the center is the spleen and the sides of your tongue are your liver. We’ve gathered all the best Pinnable Charts and we hope you learn lots of information along the way. You will also find a video further down our page that has additional health news that you will not want to miss. Please remember, this is general information only. It is no substitute for a Health Professional or your Doctor. If your tongue is red with cracks on the surface, this usually indicates a fungal infection in the body. It’s often accompanied by night sweats, problems sleeping and irritability. A pale tongue surface can suggest anemia or a hormonal imbalance in women. Antibiotics can often have an adverse side effect on your tongue too. Be sure to also check out how to use Coconut Oil (Oil Pulling) to improve your dental health and hygiene plus detoxify your body using all natural ingredients. Tongue diagnosis is an ancient Indian diagnosis technique which many health issues can be diagnosed. When the tongue is examined, a number of things are taken into consideration. The color of the tongue body, its size, and shape, the color and thickness of coating is an indication of abnormalities. These signs reveal the overall health to specific organ function, especially in the digestive system. The tongue is a fleshy mass and has color, texture, and shape independent from the apparent qualities of the tongue coating. A pale tongue body indicates the excess cold. An overly red tongue indicates excess heat. A pale purple color indicates the stagnation related to cold. A reddish purple tongue indicates the stagnation related to heat. A bright red tongue color may indicate iron or vitamin B12 deficiency. A normal tongue is a pink or light red color. The red tip of the tongue is linked to heat in the heart. A scarlet color tongue may indicate heart or lung issues depending on the area of the swelling. A pale tongue body indicates blood circulation deficiency. As you can see, your tongue has plenty to say! A swollen tongue indicates both spleen and heart heat. This could be due to excess alcohol consumption. If you have a big or enlarged tongue, this indicates the deficiency of spleen and kidney. A hammer-shaped tongue indicates the spleen, stomach, and kidneys and can be linked to serious medical conditions. Some of these include mental illness. If your tongue is swollen on both sides, this could be affecting your liver and gallbladder. Swollen between tip and center of the surface may cause lung and spleen issues. The Tongue represents the strong visual indicators of a person’s overall harmony or disharmony. It is one of the best resources for understanding your inner health. 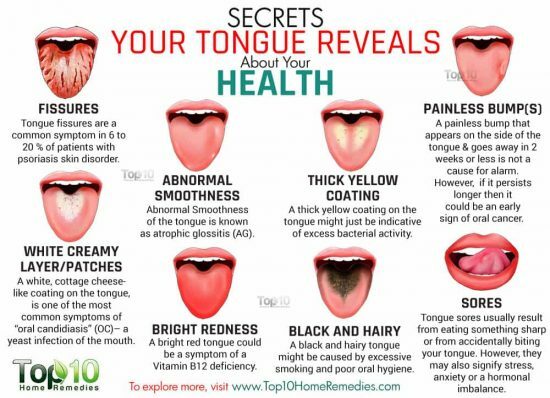 A thin yellow layer in the middle of your tongue can suggest problems with digestion and skin diseases. Swollen edges on your tongue and a thin white layer is usually an indicator of digestive system problems and susceptibility to water retention. Scraping the tongue has cumulative benefits: fresher breath, less plaque buildup, and healthier gums. It’s easy to do, totally painless and a Tongue Scraper is very inexpensive. Did you know that the tongue is the strongest muscle in your body? It’s not just there for your sense of taste. Tongue Scraping is a great way to clean up your tongue and this combined with regular Oil Pulling can take your oral hygiene to a whole new level. This Tongue Diagnosis Chart is a handy one to pop in your bathroom. You can then reference it as you need it. While you are here, be sure to check out our other very popular post. You can get the inside scoop on your poop.